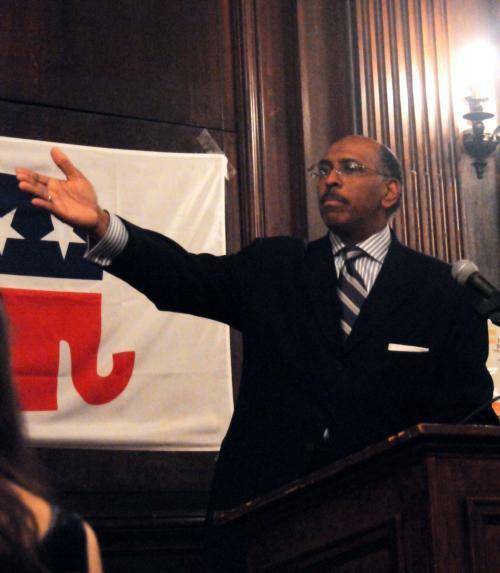 Michael Steele, former lieutenant governor of Maryland and political pundit, speaks at the annual Lincoln Day Dinner in Eliot Dining Hall last night. Former Maryland Lieutenant Governor Michael Steele emphasized the important role that students will play in the upcoming election at the sixth annual Lincoln Day Dinner in Eliot House dining hall last night. The Harvard Republican Club (HRC) and the Black Men’s Forum (BMF) co-sponsored the dinner, which attracted approximately 150 students—the largest audience ever to attend an HRC event, according to HRC President Caleb L. Weatherl ’10. Steele, who became the first African American elected to a state-wide office in Maryland when he became lieutenant governor in 2002, is now the chairman of GOPAC, a Republican political action committee. In his speech, Steele urged young conservatives to get involved in the political process. Steele spoke with enthusiasm about the partnership between the HRC and the BMF, which co-sponsored the event for the first time this year. “We need less noise of division and craziness and more noise of trying to figure out how we come together,” he said. Ralph L. Bouquet ’09, president of the BMF, said that although the club does not typically take a political stance, the group was excited about collaborating with the HRC. Weatherl underscored the role that students can play in the political process. “I think the HRC is going to have a huge opportunity to get involved with the campaign, plug students into the political process, and elect Senator John McCain as the next president of the United States,” he said. John McCain posters, t-shirts and stickers were available for purchase in the back of the hall. Literature Professor Ruth Wisse, faculty adviser of the HRC, said that she was very excited to attend the dinner for the first time. The Lincoln Day Dinner is an annual event held by conservative organizations across the country. Past speakers include Miss America 2003, Harvard Law School alumna Erika N. Harold, and former welfare mother and conservative activist Star Parker. —Staff writer Laura C. McKiernan can be reached lmckiern@fas.harvard.edu.